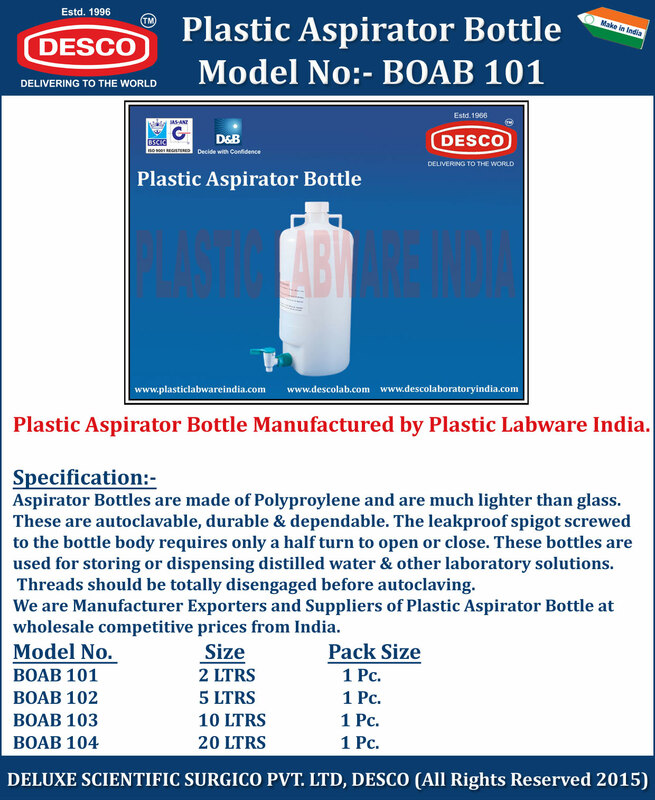 Aspirator Bottles are made of Polyproylene and are much lighter than glass. These are autoclavable, durable & dependable. The leakproof spigot screwed to the bottle body requires only a half turn to open or close. These bottles are used for storing or dispensing distilled water & other laboratory solutions. Threads should be totally disengaged before autoclaving. We are Manufacturer Exporters and Suppliers of Plastic Aspirator Bottle at wholesale competitive prices from India. BOAB 101 2 LTRS 1 Pc. BOAB 102 5 LTRS 1 Pc. BOAB 104 20 LTRS 1 Pc.